Romania reached a record economic growth in 2017, one that was mainly based on consumption. The contribution of investment became positive, but investment factor is still low and can affect sustainable economic growth in the medium and long run. 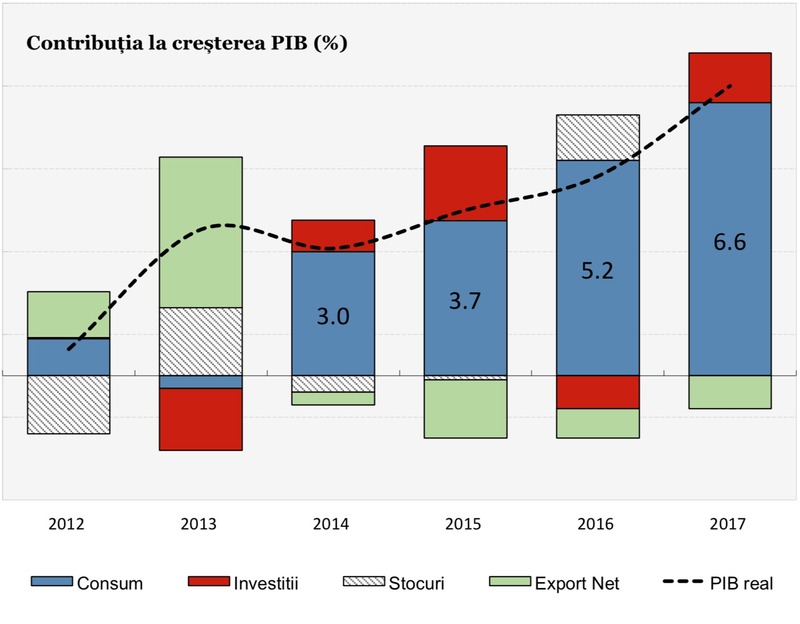 The current macroeconomic context is one of contrasts, because record economic growth and high budget deficits are abnormally intertwined, given that the budget deficit still met the 3% of the GDP target, by sacrificing the public investment programme and by implementing corrective measures. The additional economic growth achieved in 2017 was not adequately reflected by an increase in tax revenues, which indicates low performance in tax collection and fiscal administration. Employment is continuously rising, and unemployment reached a historic minimum, yet the labor market is tense due to an acute shortage of qualified human resources. The trade deficit intensified in the context of a steady increase of imports, which contributed to the deepening of the current account deficit. In the context of intense financial volatility, reflected by exchange rate and interest rates rising, intensified inflationary pressures indicate the need for a path adjustment in economic policy. In this context there is a need to shift the focus of economic policy from consumption to investment. Improving the quality of public investment by attracting European funds is essential, especially in the field of transport infrastructure. Moreover, in order to support private investment and business initiative, it is essential to ensure economic predictability and sustainability, which lately have been strongly affected by fiscal measures insufficiently substantiated in terms of economic opportunity and impact. Strengthening economic performance calls for clear priorities in the area of structural policies, inclusively by strengthening financial discipline of the economy and improving corporate governance in the SOEs sector.